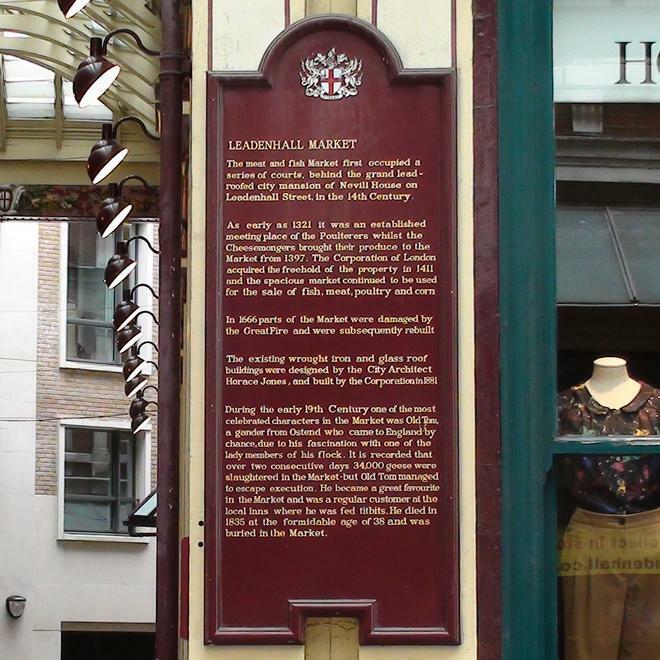 The meat and fish Market first occupied a series of courts, behind the grand lead-roofed city mansion of Nevill House on Leadenhall Street, in the 14th Century. As early as 1321 it was an established meeting place of the Poulterers whilst the Cheesemongers brought their produce to the Market from 1397. The Corporation of London acquired the freehold of the property in 1411 and the spacious market continued to be used for the sale of fish, meat, poultry and corn. 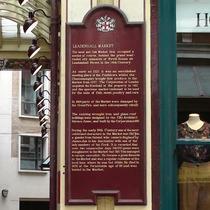 In 1666 parts of the Market were damaged by the Great Fire and were subsequently rebuilt. The existing wrought iron and glass roof buildings were designed by the City Architect Horace Jones and built by the Corporation in 1881. During the early 19th Century one of the most celebrated characters in the Market was Old Tom, a gander from Ostend who came to England by chance, due to his fascination with one of the lady members of his flock. It is recorded that over two consecutive days 34,000 geese were slaughtered in the Market - but Old Tom managed to escape execution. He became a great favourite in the Market and was a regular customer at the local inns where he was fed titbits. He died in 1835 at the formidable age of 38 and was buried in the Market.